For the second time in just a few weeks, Israeli soldiers abducted, on Sunday at dawn, Ibtisam al-‘Abed, the mother Omar, who was taken prisoner on June 21st, after stabbing three Israeli settlers to death in Halamish colony. The soldiers also abducted her other son Khaled. Following the fatal stabbing, the soldiers imposed a tight siege on Kobar village, the hometown of Omar, in an act of collective punishment against its inhabitants, and frequently invaded al-‘Abed family home. 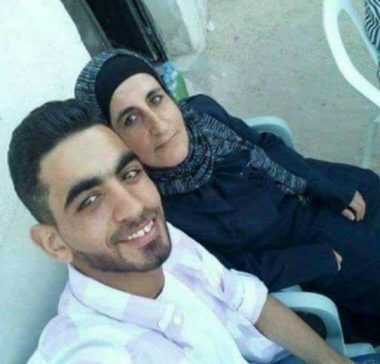 Ibtisam was abducted, at dawn Sunday, after dozens of soldiers invaded and ransacked her home, and interrogated her along with her family, before taking her prisoner along with her son, Khaled. Her husband was taken prisoner several days ago, after the soldiers invaded the family’s home. Ibtisam’s abduction came just a few weeks after her release on a 10.000 Israeli Shekels bail. Kobar village, northwest of Ramallah, remains under tight Israeli siege since the stabbing attack took place on June 21st, 2017, leading to the death of Yosef Salomon, 70, his daughter Chaya, 46, and his son Elad, 36.